The standoff between hockey players. 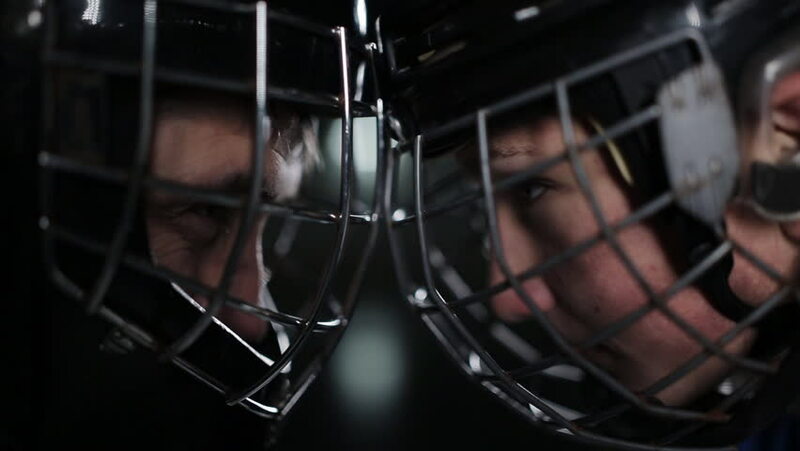 Close-up of a goalkeeper and a forward face to face, forehead to forehead. hd00:13UNITED STATES 1930s-1940s : Car parts move along a hanging track in a Henry factory. Workers on the assembly line pull these parts down to work on them. hd00:44CIRCA 1962 - Flight controllers in the Project Mercury Control Center monitor the countdown to the launch of the Friendship 7 spacecraft at Cape Canaveral Air Force Station in Florida. hd00:13Goalie hockey player waiting for the enemy stands at the gate. Close-up goalie helmet. hd00:16Two hockey players at the rink for the puck. A confrontation at a hockey field between the opponents.